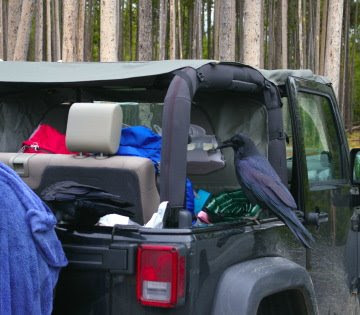 Last Saturday, when M. and I parked at Norris Geyser Basin's lot, I saw a raven burying what looked like a piece of cracker under some gravel. Later we found the source: this pillaged Jeep Wrangler. The owner and his pal came along while I was shooting pictures. They were astonished to discover that not only had the ravens ripped into some plastic bags, but they had also unzipped some luggage and gotten into it as well. If ravens are smart enough to play dead, it is not surprising that they can open zippers. We have lots and lots of ravens around Los Alamos; they're as common as pigeons. Extremely large pigeons that act more like street gangs than empty-headed cooers. Between the ubiquitous ravens and the way the turkey vultures love the thermals in the canyon adjacent to Los Alamos Medical Center, we have some of the most menacing-looking hospital grounds in the nation.